Leave home for Honolulu, Oahu - one of the single most dreamed-of vacation spots in the world. Waikiki Beach! Three nights to enjoy all the wonders of Oahu, including your hotel, Hyatt Regency Waikiki, fronting the ocean. There’s so much to see….world famous Diamond Head, formed about 300,000 years ago, the USS Arizona Memorial at Pearl Harbor, the historic Punchbowl National Cemetery, snorkel at Hanauma Bay Nature Preserve, voted Best Beach in America for 2004, ride the waves along Waikiki Beach, or just plain relaxing. Fly from Oahu to Maui, the Valley Island where we spend the next three magical nights. Maui’s unique vistas make it the most desired Hawaiian destination. Maui enjoys award winning beaches, voted among the best in the world! We’ll visit Mount Haleakala. The now sleeping volcano, is a mile deep. Her crater alone stretches seven miles across. You’ll be mesmerized by the ‘hottest show on the Island – the “Drums of the Pacific” Luau, which takes you on a journey through the islands of Polynesia. Witness the authentic dances and music of Samoa, Fiji, New Zealand, Tahiti and Hawaii. Maui is majestic and truly awesome! Your home is the award winning Hyatt Regency Maui Hotel. Three spectacular nights in Kauai, the ‘Garden Island’ is a living dream. Kauai is a tranquil haven – away from the hustle and bustle – turquoise blue skies, lush green vegetation and sparkling oceans of imperial jade. And another Hyatt Regency Hotel, the Grand Hyatt Kauai. Cond’e Nast has voted it one of the top four hotels in Hawaii. And you thought it couldn’t get any better. You’ll wonder how can so much beauty be found in one place. During your stay, you’ll visit Waimea Canyon, also known as the “The Grand Canyon of the Pacific." And there’s excitement and adventure to be found… How about a helicopter experience to last a lifetime, viewing scenic areas that aren’t accessible by land or water? Let’s not forget about fine dining on Kauai. You’ll love dining with Perillo at Dondero’s, named Kauai’s best Italian restaurant and Zagat’s 2009 Best Restaurant on Kauai winner, Tidepools. And gratuities are included! Remember – you have the opportunity to start your vacation sooner in Oahu or extend longer in Kauai at Perillo’s very special discounted room rates for up to 3 additional nights. You may also travel to the “Big Island” of Hawaii on Perillo’s three night extension. Click on the plus sign for full day description. Today we fly to Honolulu on the island of Oahu, one of the single most dreamed of vacation spots in the world. You’ll be met with a cool, aromatic flower-lei greeting right at the airport! The brilliant Hawaiian sunrise beckons you to a great breakfast… Next, a short familiarization talk on your Hawaiian adventure. (2018 Departures) - We continue on to the historic sightseeing tour of downtown Honolulu, followed with a tour of the beautiful ‘Iolani Palace, the only Royal palace on American soil. Tonight, enjoy an á la carte dinner at Hula Grill Restaurant with Mai Tai, wine, beer or soft drink included. Hula Grill’s menu is award winning Hawaii regional cuisine, including freshly caught seafood from the islands. You will want to try their famous “Hula Pie”! B, D.
See, smell, touch, taste, hear and experience a special part of Hawaii's history. Hawaiian etiquette and traditions. In 1778, Captain James Cook arrived in “Mowee” ending the idyllic life of the Polynesian natives. In Cook’s wake came traders, missionaries and whalers. At the height of the whaling era (1840 to 1865), Lahaina Town served as the anchorage for more than 500 ships! 2018 Departures: We’ll visit the quaint Makawao town, known as Top Art destination, continue through historic Paia Town with Hookipa Beach, the wind-surfing capital of the world. We will drive through Lahaina town on way to our hotel. You’ll gasp upon entering the vast, open-air lobby of the AAA Diamond Award-winning Hyatt Maui. We’ll check-in, get our bearings, and enjoy a great à la carte dinner with wine or soft drinks at the exquisite Son’z Maui restaurant or Umalu Restaurant, poolside. Of course, gratuities included. A free day of leisure to spend at Hyatt’s Ka’anapali Beach hotel. Indulge in all it has to offer to create your own perfect day. After a casual relaxing breakfast, meander through the open-air atrium with palm trees, orchids and amazing Asian art. Visit the hotel’s peaceful koi ponds…sit by its sparkling waterfalls. Enjoy the very lush tropical grounds. Of course, let’s not forget the half-acre swimming pool and world famous Ka’anapali Beach. If you have more adventurous ideas, your tour guide can help. 2018 Departures: After breakfast, we’re in for a fascinating day of exploration. Its focal point, the 10,023 foot summit of giant Mount Haleakala. The now sleeping volcano that gave birth to the island, Haleakala – the “House of the Sun” – is a mile deep. And her crater alone stretches seven miles across. She’s majestic and truly awesome! Tonight…the “Drums of the Pacific” Luau! It’s the hottest show on the island. Our luau takes you on a journey through the islands of Polynesia. Witness the authentic dances and music of Samoa, Fiji, New Zealand, Tahiti and Hawaii. Enjoy an open bar and an all-you-can-eat traditional luau featuring a superb combination of Hawaiian specialties, complete with an Imu ceremony. Kauai, the “Garden Island,” is a tranquil haven - away from the hustle and bustle - turquoise blue skies, lush green vegetation and sparkling oceans of imperial jade. After our jet ride to Kauai, we transfer to our new home for the next three nights… the super deluxe Grand Hyatt Kauai. It is not just brochure language to say this is one of the finest resorts in the world! Condé Nast has voted it among the top four in Hawaii. The rest of the afternoon is all yours. Step into a world of timeless elegance and luxury. Take in the refreshing ocean breezes from the beautiful white-sand beaches. Spend the next three days filled with sunshine, swimming in sparkling pools or just exploring the hotel’s lush manicured grounds. This evening you’ll love dining at Dondero’s, named Kauai’s best Italian restaurant, or Tidepools, where contemporary island cuisine is served. Great wine or soft drinks included. Gratuities as well. A free day! All yours. If it’s rest you want, “hang loose.” You’ll need no help. But if it’s excitement you want, take advantage of a very special sightseeing tour aboard a six-passenger jet-powered helicopter at very special discounted rates. Your tour director will be happy to advise you of other activities available on this spectacularly beautiful island. Dinner is on your own, and you’ll have lots of choices at the Grand Hyatt. This morning we’ll visit Waimea Canyon, also known as “The Grand Canyon of the Pacific.” Its vast views and imposing stature share similarities with its mainland cousin, but this canyon has a personality all its own. A day of unsurpassed beauty! Afterwards, we enjoy a quick visit to Kauai Coffee’s Koloa Estate. The largest coffee farm in the U.S., Kauai’s 3,100 acre coffee plantation is home to four million coffee trees. Another spectacular dinner with wine at the AAA Four Diamond Award-winning Dondero’s Italian Restaurant, or Zagat’s 2009 Best Restaurant on Kauai winner, Tidepools. And gratuities included! Bon appétit. If you have booked our “Big Island” 3-night extension to Hawaii, after breakfast you will be transferred to Kauai Airport for your flight to Kona. Add this independent, specially priced extension after your Two Islander Tour or Three Islander Tour. The “Big Island” is larger than all of the other Hawaiian Islands combined! There’s so much to see… white, green and black-sand beaches, spectacular active lava flow at Kilauea, stargazing atop majestic Mauna Kea, golf on one of 20 magnificent courses. Famous for its active Kilauea volcano, the Big Island is also home to Hawaii Volcanoes National Park and world-wide known Ironman Triathlon. For a seamless travel experience from start-to-finish, we strongly recommend taking advantage of Perillo’s flights to Hawaii aboard Delta Air Lines. By booking your air with Perillo, your round trip airport transfers in Hawaii will be included, provided you arrive and depart on scheduled tour dates. We recommend you book early as lowest airfares are available on a first-come, first-serve basis. Book your flights with Perillonow and pay later with your final payment! No airline cancellation or change fees prior ticketing at 60 days before departure. Or call and let us help you. Treat yourself to the luxury and comfort of flying First Class or Business Elite on Delta Air Lines. At an astonishingly affordable surcharge, this is the perfect opportunity to travel in the lap of luxury. Call for Perillo’s exclusive rate. The ‘Two Islander’ ends on Maui. The ‘Three Islander’ ends on Kauai. The ‘Big Island’ Extension guests will require return tickets from Kona. Don’t worry about your inter-island flights as they are all included in the above ‘Land-Only’ rates. Also be advised transfers on arrival in Honolulu and departure from Maui, Kauai and Kona are not included when you purchase your own air ticket. However, you may arrange ‘meet and greet’ service upon arrival in Honolulu for a nominal fee. 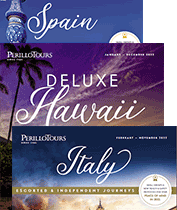 Call Perillo Tours for airport transfer information. The Hyatt Regency Waikiki Resort is the fourth largest in Honolulu with 1,230 rooms and 18 suites. It is centrally located in Waikiki, overlooking Waikiki Beach, and within walking distance of most Waikiki attractions. The architecture is classic 1920's Hawaiian and is "class" all the way. The Hyatt Kauai's Anara Spa is world renowned, with all the popular treatments available. With the fitness center, Robert Trent Jones Golf Corse, and Tennis Courts, this is a vacation resort for the active. The rooms are some of the nicest on Kauai. The pool is called an "action pool", because it has waterfalls, a 150 ft water-slide and jacuzzis. Several dining options include 5 restaurants. The Hyatt Regency Maui located on one of the longest stretches of beach on Maui, Kaanapali Beach. Built on 40 acres of tropical beauty. Guests feel like they are living the life of the rich and famous, it truly is a tropical oasis.